Commander Adama makes a risky move against the Cylons. As the Cylon attack on the fleet commences, Colonel Tigh realizes there is no hope for himself and the small handful of crew left aboard the Ariadna and he orders Red Flight to abandon them, while he prepares the ship for a suicide assault against the basestar. Tigh asks Apollo to tell Commander Adama it was the greatest honor of his life to serve under his command. When Apollo relays the message to his father, Adama is snapped out of his funk and leaves Dr. Madusa's office to assume command of the fleet. He reminds Athena that battlestars were built as battleships and it's time to remind the Cylons of that. He orders the Galactica into a full frontal assault on the attacking basestar, while sending a transport to retrieve Colonel Tigh and the others from the Ariadna. The rescue is successful and the Ariadna itself, its engines set to overload, hurtles into the path of the basestar before exploding, knocking out the forward shields of the Cylon mothership, allowing the Galactica to blow it to smithereens. The fleet proceeds onward into space. On page 10, Commander Adama reminds Athena that battlestars are fortresses and battleships, but for the longest time were used as carrier ships for fighter craft, and it's about time they demonstrated their battle prowess again to the Cylons. He orders the Galactica to engage the basestar directly. But he seems to have forgotten that Commander Cain also reminded them of it when he took the Pegasus up against three basestars in "The Living Legend" Part 2. The Galactica nameplate on the landing bay is again painted with a red background, as it was in "Dreams of the Thirteenth" Part 2. Colonel Tigh seems to have borrowed an idea of Apollo's from "Collision Course" in setting the Ariadna on a ramming course towards the attacking basestar with its engines set to go critical like a fusion bomb. In the earlier story, Apollo set the ship called Misquamacus, with bombs aboard, on a course in between two attacking basestars, the explosion taking out both basestars. There was also the Celestial Lady, likewise a ship with engine trouble like the Ariadna, left behind to take out a bunch of pursuing Cylons with a plutonium bomb aboard in "Skirmish Beyond Skafrax". 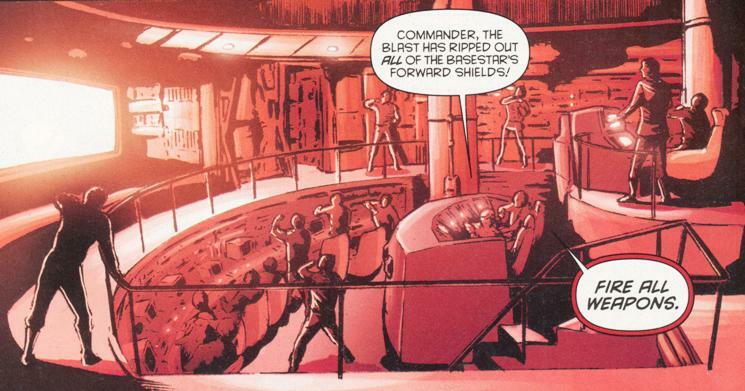 The image in panel 4 of page 16, of Galactica bridge crew witnessing the explosion of the Ariadna, is a slightly modified version of the scene of the bridge crew witnessing the explosion of the Atlantia in "Annihilation". In the above scene, it would presumably be Adama ordering, "Fire all weapons." Yet, he should be standing on the upper level of the bridge, not the secondary one. The fleet was last seen to have 211 ships in "The Fever". With the loss of the Ariadna here, the fleet is now down to 210.